The NJCA met today and took note of the inordinate delay in honouring the commitment made by the Government on 30th June, 2016 in respect of Minimum Wage, Fitment Formula, Scrapping the New Contributory Pension Scheme, Option No.1 to Pensioners, Outsourcing, Regularization of Contract/Casual Workers, JCM revival etc. At the end of the deliberations it was decided to adopt a resolution and forward the same to the Government. The NJCA was extremely unhappy to nole that the government did not honour its commitment made to the leaders of the organizations when they metlhe Hon'ble Home Minister and Finance Minister in the presence of the then Railway Ministers on 30.06.2016 on the basis of which the Indefinite Strike which was to commence on 11 .07.2016 was deferred. The reply 10 a question asked by Shri Neeraj Shekhar in the Upper House of the Parliamcnl(Rajya Sabha) given by Hon'ble Minister of State for Finance, Shri P. Radha Krishnan, on 06.03.201 B Minister, which is reproduced below, has further angered the Central Government employees. (c) If not, the reasons for the callous attitude of Government towards Government Employees?" "(a),(b)&(c ) - The minimum Pay of Rs .18,000/- p.m. and filment factor of 2.57 are based on the specific recommendations of the 7th Central Pay Commission in the light of the relevant factors taken into account by it. Therefore, no change therein is at present under consideration". The NJCA has decided to meet again on 18.08.2018 10 consider the response, if any, from the government to this letter and to the enclosed resolution. 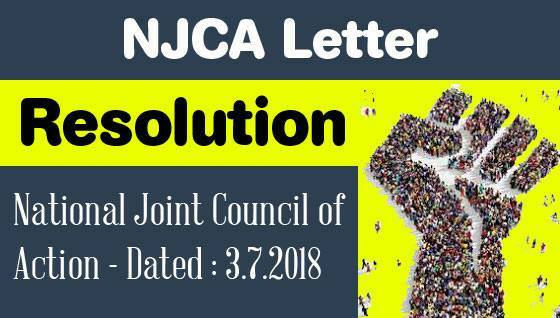 The National JCA, which met today (03.07.20 18) at New Delhi as per the notice issued by the Convenor, after deliberations, came to the painful conclusion that the government had been unfortunately indulging in chicanery for the past two years by not honouring their commitment made to the NJCA leaders on 30.06.2016. The NJCA which was formed to pursue the demands and issues of the Central Government Employees especially those emanating from the recommendations made by the 7th CPC in the matter of Wage Revision, New Pension Scheme etc. had deferred the Indefinite Strike action, which was to commence from 11 .07.2016, on the solemn announcement held out by the Group of Ministers, consisting of the Hon'ble Home Minister, Finance Minister and the then Railway Ministers. The Govt had categorically stated that they should set up a High Power Committee to look into the matters concerning the upward revision of Minimum Wage Fitment Formula etc. with a direction to submit its report within four months. The NJCA had made reasoned submissions as to the fallacy of the computation of Minimum Wage made by the 7th CPC. The meeting further noted that the report of the committee, set-up by the Government under the Chairmanship of the Secretary, Pension, to look into the grievances of the employees and officers over the newly introduced Contributory Pension Scheme in place of the existing Defined Benefit Pension Scheme, has been kepi pending by the Government without taking any action whatsoever, thereby denying the benefit of Defined Benefit Of Pension to the employees recruited on or after 1.1 .2004. The meeting also noted that, rejection of Option No.1, recommended by the 7th CPC, to the Pensioners on the specious ground that the said recommendation was not feasible to be implemented, was nothing but denial of legitimate parity between the past and present Pensioners. The meeting noted with deep concern and anguish that the government has virtually closed down the doors of negotiation by not convening the meeting of the National council JCM for the past 8 years. The meeting in the above circumstances and given the totally nugatory attitude of the government has decided to revive the Indefinite Strike action, which was deferred on 30.06.2016, immediately and call upon the Central Government employees to prepare themselves for an otherwise inevitable show down. The meeting noted that the government had been dillydallying the issue for the past two years. The meeting desired that the government must immediately address the following issues and bring about negotiated settlement thereof without any further delay. b) Scrapping the New Contributory Pension Scheme. c) Allow Option No.1 as one of the Pension Fitment Formula. The meeting has directed the Convenor to bring to the notice of the Cabinet Secretary and through him the government lhe resentment and discontent of the employees and await their response up to 07.08.2018 and put into operation the deciSion to revive the decision of Indefinite Strike action immediately, thereafter, in case no negotiated settlement is brought about on the various demands included In the Charter of Demands .